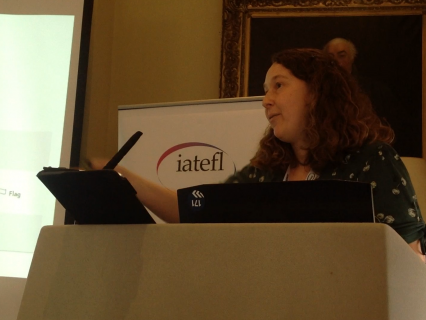 The LT SIG pre-conference event (PCE) at the IATEFL Liverpool 2019 Conference was entitled ‘Feedback in a Digital Age’ and this was an exciting opportunity for LT SIG members from all over the world to meet in person and exchange on a subject that is key for language learning. There are countless decisions we teachers regularly make regarding the feedback process, which could certainly be facilitated by learning technologies. However, what is their role and what developments can we expect in the future? Are there some teacher functions regarding feedback that digital technologies could eventually carry out themselves? What exactly are we referring to when we talk about ‘feedback’ and what assumptions about it are embedded in these questions? In the morning, four sessions dealt with this topic from very different perspectives, and these were followed by workshops in the afternoon and a concluding round table discussion. All-in-all, many insights into digital feedback provided food for thought to continue exploring these questions. Angi Malderez presented first. Angi, who has extensive experience supporting teacher learning and mentoring provided an insightful theoretical framework for the day. She stressed the need to go back to the definition of feedback as ‘mutual influences of human interactions’ rather than the one-directional one that seems to prevail, in which teachers are ‘judgementored’ and assessed instead. Feedback is not an act of giving, but of developing teachers’ ‘learnacy’ – their ability to learn from their own and others’ experiences. Note: LTSIG members can read a full report of Angi’s session in the next edition of LT.
Helen Allen and Tom Booth were next. 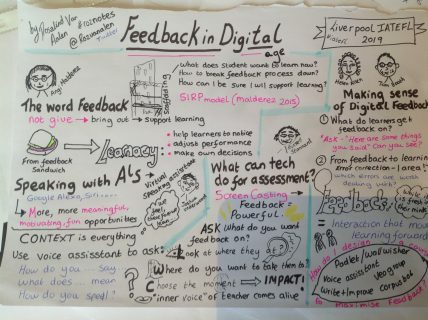 Part of the Digital and New Product Development team at Cambridge Assessment English, their session posed a number of questions relating to digital technologies and feedback: What do we give feedback on? What affects how we give feedback? What kind of feedback has the best impact on learning? What are the implications of that for digital technologies and giving feedback? What’s the best place of technology regarding it? Is it to aid the feedback process or to provide automated feedback? Does literature on this subject need to be updated in light of recent developments? Note: LTSIG members can read a full report of how digital tools may provide the answers to these questions, along with limited access to the tools mentioned in the next edition of LT. There will also be a link to the recording in our members’ area. Joshua Underwood, a teacher and teacher trainer at British Council Bilbao talked about using AI and voice interaction technology in the classroom and invited us to view voice assistants as allies for language learning. The fact that voice recognition software needs very clear instructions and pronunciation to follow your command creates a genuine need to be accurate in the use of language and speak with intelligible pronunciation. They provide instant, meaningful feedback for students in the form of success (or not!) in their online query. 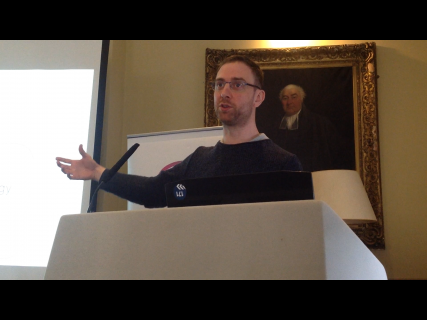 Note: LTSIG members can read a full report of Joshua’s session, with a link to the recording, his slides and examples in the next edition of LT.
Russell Stannard next spoke about what he has learned about screencasting feedback over the years. He has found that this way of providing feedback has strengthened students’ sense of ‘teacher presence’, of closeness, which is key to online learning, as there are no face-to-face instances and so strategies to facilitate interaction are needed. While this is a very powerful tool, he stressed throughout the talk that what matters the most are the pedagogical questions and decisions that underlie every technological action, illustrating it with his own journey from focus on technology to focus on pedagogical decisions and underlying beliefs that should inform them. What do we need to provide feedback on? Follow this link to see him in action! Note: LTSIG members can read a full report of Russell’s session and an interview with him in the next edition of LT.
Next you’ll find an illustrated summary of the day delegate Rosalind Van Aalen Grant produced (@Roznotez on Twitter) which was added to this padlet. Below this are a few more interviews with attendees of the PCE. My full report on the day, as well as a review of the showcase, will be in the next LTSIG newsletter. Videos from both will also be shared via it. All in all, the PCE was a great opportunity to get reflection and conversation started among delegates on the very relevant, open-ended topic of feedback, how emerging digital technologies can maximise it and how pedagogical concerns are always at the heart of these discussions. Let’s keep the conversation going!